By focusing on its strength, its key customers, and underlying values they need, MARTINS LIBRARY paint will increase revenue to more than……. In three years. This business plan leads the way. It contains our vision and strategic focus: the paint contractors and home owners in our local markets. It provides the step-by-step plan for entering the market and seizing up to 40% of the market in four years. This plan include this summary, chapters on the company, product and services, marketing forecast, management team and financial plan. The business name is MARTINS LIBRARY PAINT LIMITED. The head office is situated along (address here). It includes a show room and an office. Our factory will be located at (location) which is 6km away from our head office. MARTINS LIBRARY PAINTS LIMITED is a proposed company under the painting sector of the building and construction industry in Nigeria. The painting sector has recorded great proliferation due to constant demand for paints in our country Nigeria. The vision of the company is therefore to become a household name in the South Eastern part of Nigeria in five years. The mission of the company is to help our customers get maximum satisfaction and the desired aesthetics of their buildings at present and in the future. 1. To present an improved quality goods and services in the painting section. 2. Continuous training of our employees for efficiency. 3. To endeavor to get the best for the benefit of the consumers. 4. To add value to the society through creation of employment. Our proposition is to be different from the big retail chains. We offer our target customer, who is service seeking and not self-reliant, a vendor who acts as a strategic ally, at a premium price that reflects the value of reassurance that our coating systems will work. CUSTOMIZATION OF PAINT COLOUR: The Company shall extend its services to allow the customers make a choice of their colour. Their choice shall be made available at any time they need it. Our products will be made of high quality and good quantity of materials. The products when applied on structures will not need to be recoated like other paints, that is, it will only be coated once. It will also contain Aluminum Silicate that will make our products to glitter. Direct contact with our consumers: Our consumers will to not need to pass through the middlemen in order to reach us. We intend to achieve this by having agents that will create a direct link between our company and the consumers. Acknowledgment of customers’ feedback: Consumers’ complaints will be worked on with urgency and not overlooked. To be updated by gathering information about our product and improving on them. On a monthly basis, agents from our company will be sent into the market to get information about our product in order to improve. MARTINS LIBRARY PAINT is a proposed paint making and painting company in the building and construction industry in Nigeria. The business is proposed to start by January 2016. Emulsion paint is our main upscale line of product, it is our best product for all buildings - residential, schools, churches, and market square and airports. Emulsion paints are easier to apply, spatter resistance and fast drying and have no unpleasant odor during application. In service and support, we offer a range of working and depot services. We also offer excellent painting services. Through our quality products and services we assure our customers that they would get that ultimate satisfaction they have always desired. Our company will provide products and services that would last for a good period of time which our customers would also benefit from them. Our products are going to be affordable by both the middle and local people in the environment at a moderate prize. Having different branches in the south eastern Nigeria, our company’s products would be available and ready anytime and anywhere. Our customers would also benefit from our products and services because we will produce any type of color they want from us therefore leading to their satisfaction. We have buses that would serve the purpose of transportation and will therefore make available our goods to our customers any time they need them. METHODS OF PACKAGING OUR PRODUCTS/SERVICES FOR DELIVERY. Generally, paints are stored in air tight bucket. MARTINS LIBRARY will also follow the trend. MARTINS LIBRARY PAINT LIMITED plans to store paints in drums. Our products will also be packaged in air tight buckets. In packaging we will also segment our products in smaller drums of five litters. The segmentation is to enable customers who have the need of small quantity of paint to also enjoy our quality product. MARTINS LIBRARY PAINT targets to get forty percent of the market share in the south eastern part of Nigeria. Our target customers are building owners, contractors, painters and chain stores. We intend to use newspaper advertising and online medium as our main way to reach new buyers. As we change strategies, however, we need to change the way we promote ourselves. Our company is located at (address here). Reason for the location is because it connect to the three major road in (location here). The method of recording is by paper and electronic. The system of accounting is by double entry accounting system and will also prepare manufacturing account and stock valuation. The company’s financial accountant will be responsible for keeping the record. Martins Library paint is currently owned by twenty-five shareholders. It is a private limited liability company which separate personal assets of shareholders from business asset. Also guarantees the continuity of existence of business, easy capital raising and high scope of business expansion. Martins Library paint will start off its business in January 2016 with eight management personnel. More workers will be employed as the business grows. In painting, the company will make use of adhoc painters when necessary. Below are the eight management staff that will start off the company and their positions. Mr. B, the operation manager has eight years of experience in manual paint making. He managed a company store in (address here) and he was instrumental in the development of MARTINS LIBRARY paint. Mr. H, the service manager has four years of experience in painting. He has handled several painting contracts within and outside (name of state here). At present we have a good team for covering the main point of the business plan. The training of our managers before starting the business will be an important way to cement our fundamental positioning in the market. 1. The prices of our competitors might likely reduce therefore making our customers run to them. 2. Inexperienced management team of the company may lead to slowing down the rate at which the company sales. 3. Low sales of our products leading to reduction of our profits. 5. Unstable economy situation might also turn out to be a risk, because in the future due to the economic situation customers might prefer wall tiles to paint application. 1. The company will maintain market fair price with adequate distribution channel. 2. Our main tactics include; application expertise, excellent training and developing of our management team before starting off the business. 3. The company would apply different marketing strategies in order to make more sales yielding to profits. 4. Our company would import the improved machines that would stand the thirst of time. 5. The company would also be flexible in enrolling in the current trends by going on continuous quick environmental scan to gather basic information about our environment so as to adjust. 1. The customization of our products and services will make our customers demand more of our products in the environment. 2. The company also intends to establish a cordial relationship between us and our customers which would lead to maintaining our customers. 3. Considering the number of shareholders, there would be inflow of capital. Through our management skills, there would be a number of investors who would invest in our business. 4. Our business location is also our strength. Located at (address here) which controls three major roads in (location). 5. Our company will have well-trained skilled man power for takeoff. Also considering the newness of our paint, its quality and its moderate price, we believe it would be demanded at a higher rate. 1. Making of paints does not really require special training, therefore it would be simpler and easier for local consumers to produce paints as well. 2. Lack of close substitutes for our raw materials. Almost all the raw materials used in the production of paints are chemicals which are purchased. 3. Little chance of recognition in the market environment due to our new presence in the business environment. 1. Relatively low competition since we have less paint production companies in our business environment. 2. Online shopping and advertisement thereby allowing customers from other states to have access to our products and service. 3. The company is located at a great proximity to the market. 4. As an indigenous company, we are likely to receive support and approval from the local government because it would serve as a platform to develop the local government. 1. Competition from other paint production companies. 2. New market strategy from our competitors. 3. Tremendous change in demand of paints in future by our customers. 4. Instability in government policy. Start with the purpose of your painting business. List your goals and any products or services you plan to offer your clientele. Describe how your business will differ from the other painting businesses in your area. Research your competition and project your income. Encyclopedia of Business, 2nd ed. 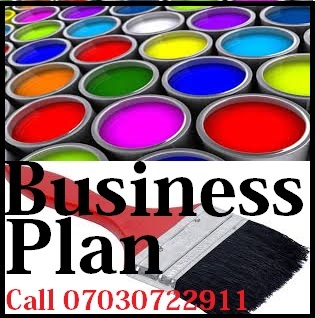 Painting Company Business Plan: Business Plans - Volume 10.